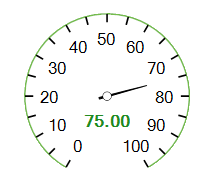 RadialGaugeSingleLabel is suitable to present additional information for the RadRadialGauge, e.g. 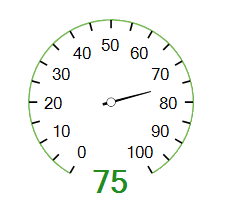 current value.To add a single label to the gauge, you should add it via the RadradialGauge.Items collection. 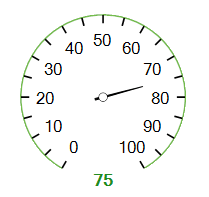 BindValue: Indicates whether the single label's text is bound to the gauge's Value. LocationPercentage: Controls the label's location (x, y) according to the center point. LocationPercentage: Accepts values withing the range [(-1,-1), (1,1)]. 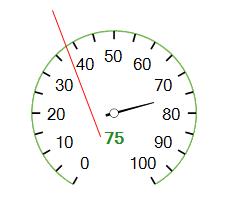 On the picture below, the green single label has LocationPercentage = (0, 1). LabelFontSize: Specifies the label size. LabelFormat: Specifies the label format. By default, it is set to #,##0.#. On the following picture the single label has format N2.